When you first see the Vandal One, it’s not uncommon to assume it’s another European-made track beast. Folks over there really know their performance track cars, after all. Well, it isn’t. 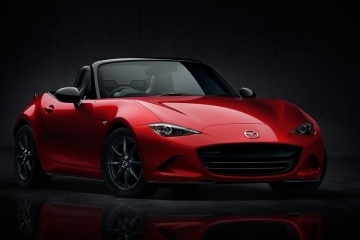 Instead, the upcoming vehicle is being manufactured right out of Detroit, making it the rare production track car that’s actually American-made. Billed to deliver “the closest experience possible to a Formula 1 car,” the vehicle definitely has the looks to merit the F1 comparison. Whether it can come anywhere close to the performance of the pinnacle of auto-racing, though, is another matter, so we guess we’ll have to wait till people are actually driving (and, occasionally, crashing) it on their local speedway. 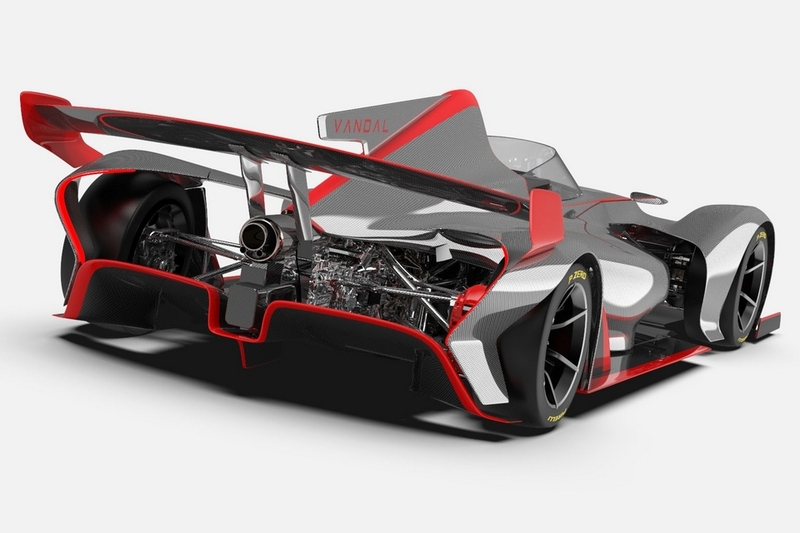 The Vandal One starts with a full carbon fiber monocoque chassis that’s decked in carbon fiber body panels, allowing it to tip the scales at a curb weight of just 1,224 pounds. 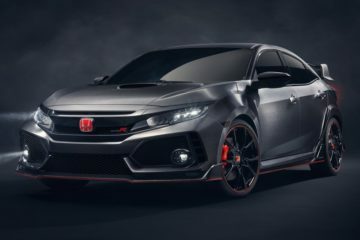 Under the hood sits a 2.0-liter turbocharged four-cylinder Civic Type R engine that, ordinarily, puts out 306 horsepower. 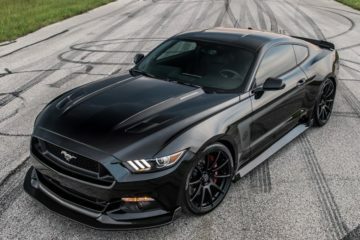 For the vehicle, though, they tuned it to increase the output to 340 horsepower in the standard model, with an upgrade package that can boost it to a whopping 560 horsepower (we have no idea what’s in that upgrade, but it must be something seriously potent). That’s, pretty much, a ratio of 1,000 horsepower per ton, which puts the vehicle in quite exclusive company, even among track-focused automobiles. This version of the engine, by the way, will rev to 9,000 rpm despite using forced induction, so you can tell the engineers put in a lot of work to squeeze as much as they can out of the powerplant. All that power is sent through a Sadev six-speed sequential gearbox, with a paddle shift system and autoblipping. 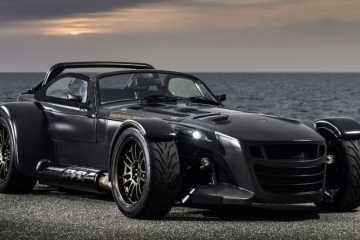 The Vandal One uses an F1-style pushrod suspension on both the front and rear, complete with adjustable racing dampers, anti-roll bars, and customizable spring rates, while the car’s hydraulics can adjust the ground clearance anywhere from two to five inches above the road. It has 18×10-inch wheels out front and 18×12-inch wheels in the rear, as well as monoblock four-pot aluminum calipers on the brakes, which, according to the outfit, is capable of over 2Gs of braking force. 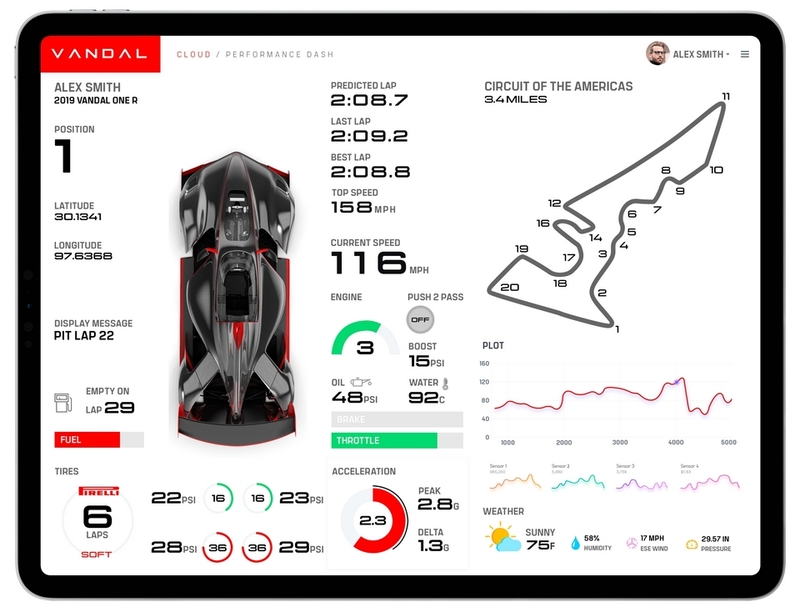 There’s even a baked-in telemetry system courtesy of 12 sensors and a camera, allowing automatic real-time monitoring of vehicle data for the team watching the race from the pit lane. 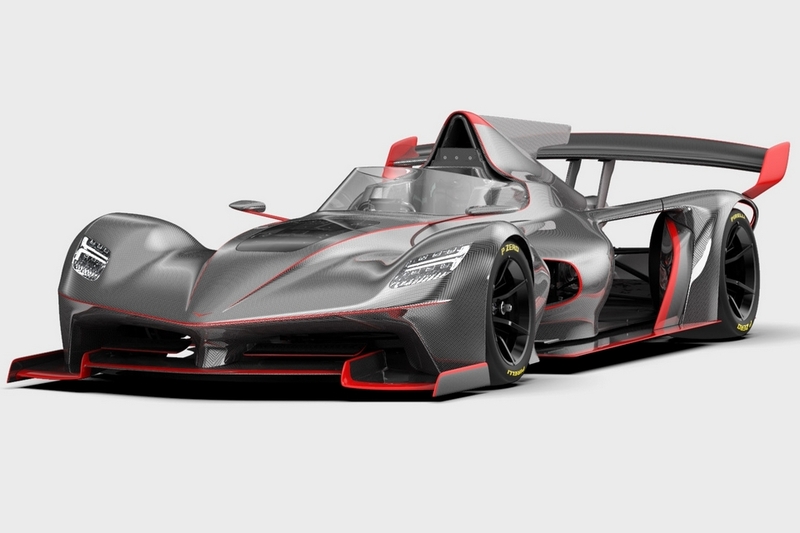 The car’s carbon fiber bodywork, by the way, is completely independent of the chassis, complete with quick-latching and removable sections, so future aero upgrades can be easily made, allowing owners to evolve their vehicles over time. Designed with safety in mind, the body has FIA-compliant crash structures on the front (crash box), rear (attenuator), and sides (zylon intrusion panels), as well as an FIA-spec survival cell with neck braces, so buyers won’t turn into wealthy dead race enthusiasts anytime soon. The base model of the Vandal One will cost $119,700 when it ships later in the year, with no pricing announced yet for the 560-hp upgrade package and other options. I about spilled my coffee when you said the Vandal One is from Detriot. This is the type of car we need to make more of here in the United States and sell them Worldwide. The Vandal One is the car to get people excited about cars. The fiber carbon chassis and body panels make this car super-light. Imagine if you had the full package with 560 HP sitting in a car this light! 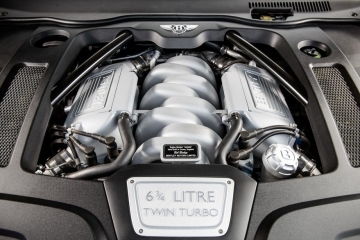 Is a carbon fiber chassis even safe with a car with this much torque? It seems like the carbon fiber would be more prone to breakage. A carbon fiber chassis will hold up just fine. The problem with carbon fiber isn’t the strength of it, but the price. It is hard to buy affordable carbon fiber, so that is why carbon fiber frames are currently used primarily by small independent companies. Once car companies can access carbon fiber cheaper, they will then start building more with carbon fiber. Tye Vandal One Track Racer isn’t really breaking any new ground with the design. Formula 1 cars have been using fiber carbon monocoque chassis, as well as many other components too including a carbon fiber suspension setup. 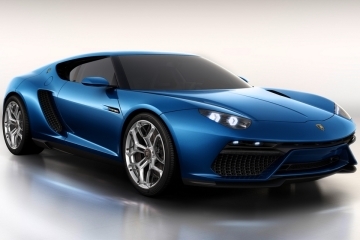 When major car manufacturers can afford to start using more carbon fiber, we will see some really intriguing designs. Carbon fiber is able to be formed into any shape, so car designers can start with a fresh palette on ideas of how the future of cars will look. The lighter weight of carbon fiber compared to aluminum and steel is truly astounding. The lighter weight of the carbon fiber frames and chassis will help give cars a higher fuel mileage rating. The better fuel rating will be with mass-produced cars from companies such as Ford and Toyota. As far as race cars go, the fuel mileage isn’t really as noticed as with regular cars. Carbon fiber is easy to form into any mold, is lighter than steel and aluminum, is stiff and strong. Carbon fiber is the future of cars. Thelaucn edition of the Vandal One Track Racer will only have 50 units, but I am curious as to when they will start releasing the second round of these. I cannot afford one no matter what, but it does have me salivating. The side profile of this car is absolutely gorgeous. Unlike Elio, the Vandal cars are actually getting made. Vandal designs the cars then put them up for sale and they build them. Simple. Too bad Elio couldn’t be managed by Vandal. Although it is not a track car like the Vandal, the Elio initially had a lot of people excited, but it looks like they will never be made now. How well will the side panels hold up if you are racing this and your panels smash into another car? 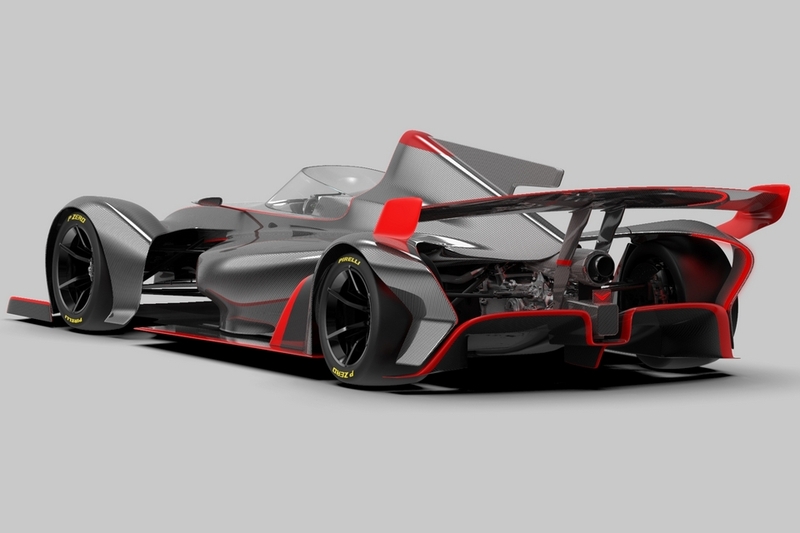 I can see a lot of interest in this car, its basically a Formula One car that can be bought off the shlef by any regular old person, I just can’t seen many people that can afford to get on except for professional racers. I wonder if the Vandal One would spnsor some races or indivdual racers. It’s be nice to see some homegrown track racers get a chance to race something like this in a different class and at larger road cicuit style tracks. Instead of denting, they’ll just shatter. They are easily replaceable, but the cost will be high since the manufacturer is the only one making the side panels. Not many aftermarket accessories will be available for an expensive racing car like this. If you can afford to buy and race a car like this, then I am sure the side panel replacements won’t be much of an extra burden in the overall financial picture. That’s what racing sponsors are for.